Elizabeth Thompson, a researcher for Friends of Casco Bay, tests the pH levels of the mud in Mill Cove in South Portland, across the harbor from downtown Portland. The phenomenon is another threat to Maine’s shellfish industry, estimated to be worth $60 million annually. Dean Doyle is a longtime shellfish harvester based out of Phippsburg. He said clammers are quick to promote practices that sustain their industry, such as seeding clams in the mud flats to cultivate future populations for digging. But Doyle, who said he has turned to foresting for additional income in the absence of reliable shellfish harvests, said muds like those described by Green are hopeless. And they’re growing. Denis-Marc Nault, a biologist with the Department of Marine Resources, said he’s aware of the concern over high acidity in clam flats, but with a staff of just two people to watch over nearly 150,000 acres of intertidal flats, the state hasn’t been able to map out acidic trouble areas or conduct enough studies to be sure acidity is causing the die-offs in places where clammers are seeing them. Nault said changes in salinity can be deadly for young shellfish as well, and said he and the one other department biologist assigned to monitor Maine’s flats are stretched too thin to do the comprehensive research necessary to determine how pervasive the dead muds are. Conversationally, the notion that Earth’s oceans are becoming more acidic is often lumped into a larger discussion about climate change, said Joseph Salisbury, a researcher in the University of New Hampshire‘s marine program and a South Portland resident. But unlike the politically volatile subject of global warming and its potential causes, Salisbury said, there’s no such debate about ocean acidification. Adding carbon dioxide to the ocean adds to the water’s concentration of hydrogen ions, increasing its acidity. Green said the Earth’s oceans absorb more than 21 million metric tons of carbon dioxide each day. Casco Baykeeper Joe Payne said the pH of coastal ocean waters has decreased by 0.02 over the past few decades. 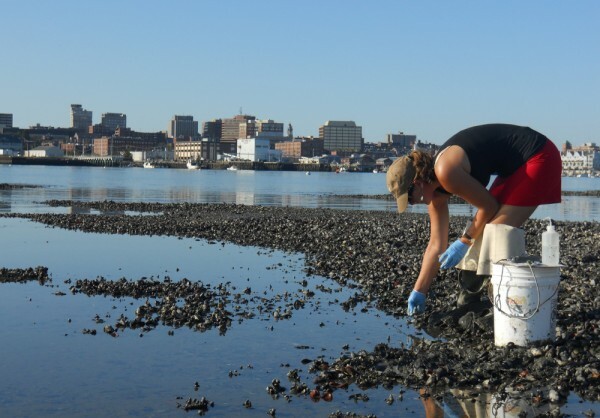 What Payne described as a “major problem” in the form of worldwide ocean acidification, though, isn’t the only problem for Maine’s shellfish flats. There are no limits now on how much nitrogen can be discharged into Maine waterways. “If you have a very productive ecosystem, which the Gulf of Maine is, and you add a little nitrogen, it gets even more productive,” said Salisbury. The environmental advocacy group Friends of Casco Bay, to which Payne belongs, has launched a campaign urging Mainers to keep an eye out for “green slime” — thick carpets of algae covering shallow coastal waters. The green slime is a sign of excess nitrogen, Friends of Casco Bay warns, and excess nitrogen carries a host of consequences for an ecosystem aside from bad aesthetics. The same nitrogen that causes a freakish bloom in algae causes an explosion in the microscopic phytoplankton populations. Those massive numbers of phytoplankton then die, fall to the mud at the base of the water and decompose, releasing more concentrated carbon dioxide to the fragile mud ecosystem and driving the pH further into acidic territory. “Only now are we considering the effects on shelled organisms,” Salisbury said. “This is a big concern, and it’s only recently been studied. People have always known about the chemistry, but the effects on the organisms [are just being researched]. A 2008 resolution of the Legislature, promoted by Friends of Casco Bay, directed the Maine Department of Environmental Protection to develop limits for the amount of nitrogen allowable in Maine waters. Angela DuBois, who works in the department’s Bureau of Land and Water Quality, is in charge of drafting those numeric limits in time to meet a July 2012 deadline, after which the Legislature will review and consider implementing them. DuBois said setting those limits is “the first step” in a longer process to control nitrogen pollution. When the numbers are set, the DEP will try to maintain them by regulating the amount of nitrogen discharged by identifiable sources, such as sewage treatment plants. The department also has programs set up to educate the public about controlling “nonpoint sources” of nitrogen pollution, such as residential and farm fertilizers and road runoff. But DuBois acknowledged the nonpoint sources will be “more difficult” to control. That could leave dischargers such as factories or sewage treatment plants shouldering much of the burden of curbing nitrogen levels. For his part, Higgins is partnering with Dobbins to experiment using kelp to control nitrogen. The saltwater vegetation absorbs nitrogen from the water, and Higgins has a Department of Marine Resources permit for two kelp beds, one near the the district’s primary treatment plant and another near Bayville. Bill Mook, head of the Walpole-based Mook Sea Farm, said his Damariscotta River oyster farming operation has taken note of dropping pH in the water and chooses to refill its nursery tanks during times of day when the waters are tested to be less acidic. Finally, Green’s research suggests that one of the best controls for pH in mud is the return of clamshells. While harvested clams are typically taken upland, shucked and eaten and the shells tossed in the garbage, Green advocates for the shells to be saved and spread back over the flats from which they were harvested. The shells provide doses of calcium carbonate — acting like “Tums” in the mud, he said — to combat the lowering pH. Green said the various localized attempts at slowing the creep of acidity into coastal marine life will help for only so long.